Punjab Chief Minister Captain Amarinder Singh on Wednesday urged the Akalis to join the efforts of his government to ensure a befitting celebration of the 550th Parkash Utsav of Sri Guru Nanak Dev Ji, and asked the Shiromani Akali Dal (SAD) deputy leader in the Vidhan Sabha to speak with his leader on the issue.During his reply to the Governor’s Address, the Chief Minister said the sacred occasion demanded the united efforts of one and all, rising above political lines.Hailing the opening of the Kartarpur Corridor to coincide this auspicious occasion as a victory for the efforts of the Congress, which were initiated by Dr. Manmohan Singh and also pursued personally by him, the Chief Minister once again called for a visa and passport free ‘khule darshan’ through the corridor. 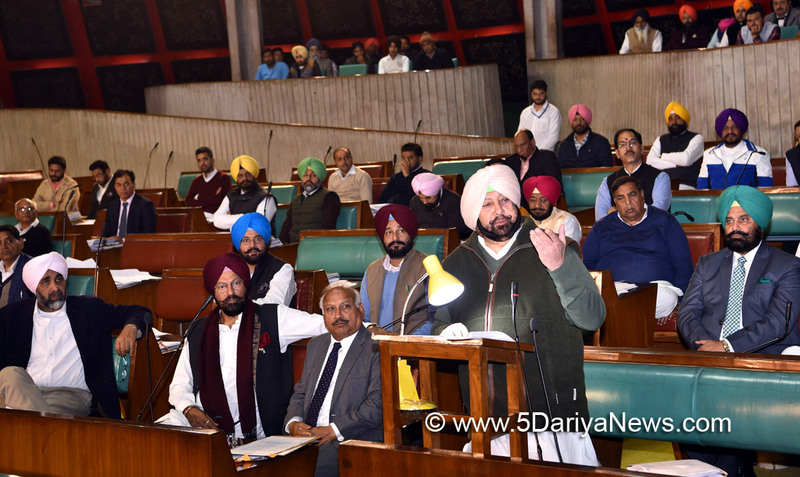 If passport and visa are made mandatory, lakhs of people would be deprived of the opportunity, which was not logical, he said, adding that he had already requested the Government of India to accept his suggestion.Conceding a request from MLA Rajpura Hardyal Singh Kamboj, the Chief Minister agreed to establish a chair in the name of legendary martyr Udham Singh in Punjabi University Patiala. The step would go a long way in rekindling the spirit of patriotism and nationalism amongst the youth, he added.Noting that there were several names inscribed in Punjabi in the Andaman jail, the Chief Minister further suggested construction of a memorial in the state in their memory. The Speaker informed the House that the Vidhan Sabha had already constituted a Committee which would soon visit Andaman and Nicobar islands and suggest to the Central Government to duly recognise supreme sacrifices made by them.Referring to the resolution passed today unanimously by the House demanding an apology from the British government for the Jallianwala Bagh massacre, the Chief Minister hoped it would strengthen the case of others who were fighting for it in the House of the Lords, where a debate on the issue was going on.